Over 70 per cent turnout was reported on Monday in the by-election to the Jind assembly constituency in Haryana, dubbed as a prestige battle for all four major contenders ahead of parliamentary and assembly polls. The ruling BJP, Congress, the Indian National Lok Dal (INLD) and the Jannayak Janata Party (JJP), which was formed after a split in the INLD, have pulled out all the stops for a victory, which could prove to be a morale booster for the rank and file. As per preliminary figures, poll percentage at 5 pm has crossed 70 per cent. According to the officials, the final turnout is likely to be higher as there were people in queues in several booths after 5 PM, the scheduled time for voting to end. The polling began at 7 AM. The bypoll was necessitated following the death of INLD MLA Hari Chan Middha, whose son Krishna Middha recently joined the BJP and is the saffron party's candidate for the by-election. The Congress fielded chief national spokesperson and sitting MLA from Kaithal constituency Randeep Singh Surjewala. Twenty-one candidates including two women are in the fray. In the final two hours of polling, there was a rush outside booths, especially in rural parts of the assembly constituency, as voters queued up to exercise their franchise. Officials here said 15 per cent polling was recorded in the first two hours and by 3 pm, the poll percentage had crossed 60 per cent. 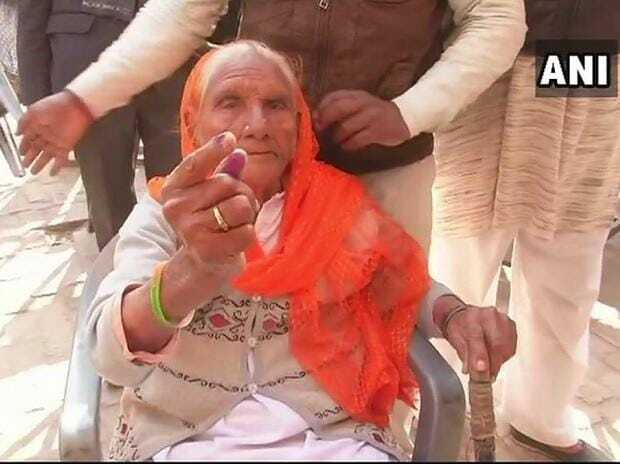 A couple of nonagenarians were amongst those to cast votes early in the morning. Nearly 170,000 people, including 80,556 women, were eligible to vote.